> I shall be glad if you will permit me, on behalf of the Council of the Royal United Service Institution, to draw attention to the fact that a sum of £240 is still required to complete the purchase of the silver statuette of Lord Nelson which has been on view in the Museum of the Institution. The statuette stands nearly three feet in height. The workmanship has been pronounced by experts to be early nineteenth century, and the modelling exceptionally fine. The statuette was presented by his Majesty King George the Third to the great admiral on the anniversary of his victory of the Nile, and is, therefore, of historic national interest, as well as an object of artistic merit and intrinsic value. Members of the Institution, not having already contributed, and all admirers of our great naval hero, are invited to send a donation to the secretary of the Institution, to enable the Council to complete the purchase of the statuette. I may add that H.R.H. the Prince of Wales, on a recent visit to the Museum, evinced particular interest in the statuette, and expressed a wish that it might find a permanent home in the Institution. His Royal Highness has given practical expression to this wish by graciously accompanying it with a donation of £10 to the fund. " > I would be interested to find out if anyone can identify the statuette in question. From the description it sounds quite a substantial figure and must be worth a tidy sum now. Was the United Services Institute successful in purchasing it then? Is it on display now somewhere in the country, in the National Maritime Museum collection following the break of the United Services Inst. collection, or is it now part of a private collection? What an intriguing story you have uncovered here. I had no knowledge at all of this statuette but I have access to a couple of newspaper databases so I thought I would see what I could discover. Firstly a copy of this letter was definitely in the Times but it was dated 19th February rather than July. But now the amazing thing - it transpires that behind this request was a fraud/hoax!! I've got a newspaper article here which explains all. I can reproduce it in this thread but will have to do it in 2 pieces. So I'll grab myself a cuppa and sort something out in the next hour or so. Last edited by Mark Barrett on Sat Nov 01, 2014 10:55 pm, edited 1 time in total. Hopefully this will work. Now to see if we can find what became of the statuette. I'm not sure if people are aware but there is a copy of the 1908 Catalogue for the RUSI Museum available on line. There is an index at the back and the only silver statuette of Nelson is item 421 on page 45. Unfortunately there is not enough detail to know definitively that it is the item under investigation here. But it probably is. I tried a search on the NMM website but again nothing definitive. It might be there or might be in a private collection. Maybe others can help with this piece in the jigsaw. Thank you very much for your response to my query and the information you have uncovered. It was certainly a surprise to read that this was eventually found not to be the genuine article at the time. It just goes to show that even expert opinions are not always correct. I'm no silver expert but I would have imagined that this would have had some sort of hallmark showing that it was late victorian/edwardian when it was cast etc, and that should have given the game away. Although I know a lot of items come up on the various TV antique programmes that have to be described as white metal because they are not hallmarked. It was also interesting to read the United Services Museum catalogue that you posted the link for. It didn't occur to me to search for that. I certainly agree that the Nelson Statuette entry that you highlight is probably the one in question as I couldn't see anything else that might describe it. It's a pity that it provided no further description or provenance. Perhaps the curators were a little embarrassed to admit their mistake and didn't want to comment further. Even though it was somewhat bogus then, with the passage of time it has probably become a very desirable piece to own and it would still be nice to find out what eventually happened to it. I did a bit more digging but unfortunately have not been able to determine the current location of the silver statuette. But before I call it a day I would like to get hold of an article which appears to have been in the RUSI Journal in 1969. The article was titled "The Historical Collections of the RUSI - recent transfers and disposals". I wouldn't expect many individual items to be mentioned but it should give a good idea whether the majority of the naval items were transferred to the NMM when the Banqueting House (home of the RUSI museum) had to be vacated in the early 1960s. They look to have a copy in Birmingham Central Library but since the new £188 million library opened getting hold of stuff like this has become a nightmare. (You couldn't make it up could you). Earliest available date appears to be the 10th December!! So in the meantime I may drop a line to the RUSI and see if they can provide a copy of the article. I don't hold out any real hope of tracking down the statuette but I had always wondered exactly what happened to the RUSI collection so getting hold of this article will serve that secondary purpose. If I do manage to get hold of the article I will report back, but assume that it will be weeks rather than days. I have googled the title of the article you mention and I've found it on a site called ' Taylor & Francis Online '. The article is by David Erskine in vol 114 issue 653 1969. It is only two pages long 64-65 and the site gives you a first page preview. The opening paragraph refers in brief to the setting up of the various individual service museums and the dispersal in 1962 of their collection of uniforms & relics when they lost the Banqueting House etc. So it suggests but not confirms that the NMM received the naval artefacts. It goes on in more detail for the more recent transfers, under the headings of Map Room and Manuscripts Collection to say that for the manuscripts, that the naval collection was transferred ' in toto' to the NMM with the exception of the Signal Books and Fighting Instructions to the Naval Library MOD, apart from the signal book for the USS Chesepeake taken by the Shannon. It then goes on to talk about the Military Collection. This appears to be a subscription website and to view the complete article is £24. I assume the Birmingham Library would be a cheaper option. So I am presuming that if the statuette was still in the possession of the RUSI in 1962 then the NMM must still be favourites to have received this. Yes, that was where I spotted this article. I was trying to avoid the £24 charge and I have to be honest I hadn't noticed it was only 2 pages long. Anyway there may be something else of interest in there so I have sent in a request to the RUSI to see if they will do me a copy. Depending on what comes from that I may put in a request to Birmingham Library as well. It looks as if they have got a run of the RUSI Journal from 1859 through to 1972. So I think I will throw caution to the wind and ask to see all the 1900s and all the 1960s. There may have been mention of the statuette when the controversy about the provenance was going on, and additional information about the break up of the museum in the 1960s. I will have to wait until 10th December, and make sure I can be free on that day. In the old library (admittedly with more staff) you could quite often request this sort of stuff and get it within the hour! I hope there may be some further clue what happened to the statuette but as I said before for me there is the secondary interest in what happened to the whole RUSI collection. I'll be back when there is anything new to report. P.S. You can assume from the above that I found almost nothing reported in the Times newspaper about what happened to the RUSI collection. There was a small piece in 1962 which said that a committee had been formed to manage the situation and that Sothebys had been asked to make a valuation. Then pretty much nothing else. 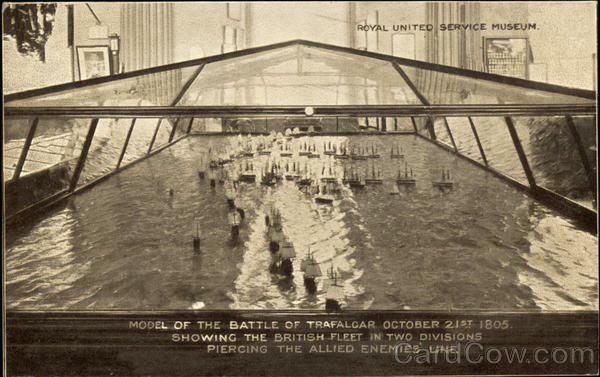 Except ONE item in March 1966 which reported the sale of the "Trafalgar documentary model" which had been on display at the RUSI since 1862. It was sold to an anonymous buyer for £2300. So at least one item did make it on to the open market for some reason or another. I have got a picture of that model in one of my books here. My scanner is attached to a different computer but if I can find time I'll make a copy and post it up. It's straying somewhat off topic but might be of interest to you and others. Just for general interest here are a couple of images of the appearance and layout of the RUSI museum in 1878 and 1896. I found this image online so no need to get my scanner out. As I said above this model was sold by Sothebys in March 1966. I don't mean to stray even further off topic - but do we know where it has ended up? It can hardly be under somebody's bed or at the back of a cupboard! It sounds like you will have an interesting day looking through the Journals. There's obviously going to be a wealth of information you'll uncover. Perhaps you'll need more than a day. Your reference and picture to the Trafalgar Display at the RUSI was very interesting. I actually have a postcard of this which probably dates back to at least the thirties or earlier. I was surprised to read that this went to a private buyer in 1966, four years or so after the date given in the article for the dispersal of the Banqueting Hall collections. Perhaps the statuette was similarly disposed of in the same way if it's not coming up in the NMM collection. When I got the postcard three or four years ago, I thought at the time that it reminded me of a display that I believe I had seen on a school trip to the NMM in the early sixties, (that dates me). But as it was sold by the RUSI a little later and to this private buyer, then it can't be the same one. As you say, where is this now? I think we're more likely to find that out than the statuette's wherabouts. I will certainly be looking forward to hearing about what you uncover in Birmingham. Perhaps your findings will warrant an article for the Nelson Dispatch. Straying ever further off-topic here but hopefully people will find this of interest. I had checked out the NMM just in case the Trafalgar model had ended up there. I came up with the 2 images below - a similar model but to a different scale and in a different case. This is maybe the one you saw at Greenwich in the 1960s. I do agree that the story of the RUSI museum would probably make an interesting article for the Nelson Dispatch. I'll see what I can do on that front. Meanwhile I think that's me done for now until I hopefully get something back from the RUSI or Bham Lib. this is all fascinating stuff and justifies any straying off-topic. Many thanks for your researches. you will have had your first encounter with Mark who loves to get his teeth into any Nelsonian mystery and never lets go. I wish I could draw: I'd devise a coat of arms for Mark which would feature a ferret, a bloodhound and a bulldog! Having come across and read many of Mark's posts in the past, I have realised his wide knowledge on all things connected with Nelson and his keeness to share and discuss this with others. I am certainly pleased that he has taken an interest in my enquiry and it has been good to correspond with him. I've also enjoyed this widening into other aspects of the RUSI and its function as a museum, library and repository for the army and navy before the establishment of the modern NMM and National Army Museums. It's history and importance probably warrants more research and publicity. I don't think I've seen much that's been published on it previously and I hope this discussion may prompt others to comment on other aspects of the story and collection. It's now 2 weeks since I sent my request to the R.U.S.I. asking if they could provide me with a copy of the 1969 article about "transfers and disposals". Unfortunately I haven't even had an acknowledgement of my request thus far so I am starting to doubt whether anything will come from that source. Meanwhile I have submitted a request to Birmingham Library to see some of their copies of the RUSI Journal. I have asked for the runs from 1900 to 1909 and 1960 to 1969. They should be available on 5th December so I will get down there on that day and see what I can find. I always keep an open mind about these sort of investigations but hopefully I will be back in a fortnight with something of interest.